Otherworld Nights is an anthology that collects several short stories and novellas set in the Women of the Otherworld series. Most of them have been previously published in other anthologies or have been released in limited edition hardcovers. It also includes a brand new novella set after the happenings of the last Women of the Otherworld book, Thirteen, featuring Savannah, Adam, Paige and Lucas. When an author has written as many books as Mrs Amstrong has, a certain consistent style gets developed. Even though the books in the series have been published over a span of ten years, and the stories in Otherworld Nights come from different periods within that time-frame, their style and wording is incredibly consistent. Diving into this anthology was such a relaxing yet exciting experience; it’s been a long time since I got to spend time with these characters, and they are real in a way. As far as I can tell the stories are ordered chronologically – the oldest story first, the new novella last. Although it does make sense, the order bothered me a bit when we had two Elena/Clay stories back to back, and we were introduced to the same characters twice. That can easily be fixed by not reading the book back to back, but instead picking a story you feel like and going through them randomly. There is no consistency between them beyond being set in the Women of the Otherworld time-line, so they definitely don’t need to be read in order. Mrs Armstrong is quite an expert on the novella format. It’s not my favourite form of fiction because it hardly allows for any complexity or side-plots, but I think these were very well done. All of them had enough twists to make them interesting, and they ended in ways that leaves the reader satisfied and with a smile on their face. 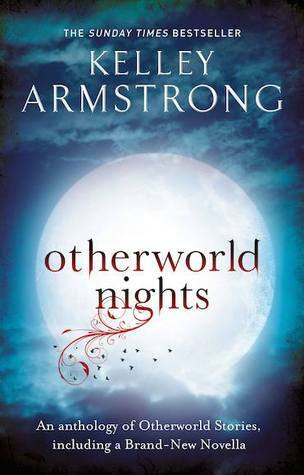 Otherworld Nights is a great book for Women of the Otherworld fans that haven’t succeeded in tracking down all those obscure novellas that have been released throughout the years. The new Savannah novella was a welcome addition, though not my favourite (me and Savannah have a rocky relationship in general). If you’re not familiar with the world, this might not be the best place to start, because there are heavy references to happenings in the series, and can also be quite spoiler-y if you haven’t completed the series yet. This short story collection will include many brand-new tales and others only previously available on Kelley Armstrong’s website. Most of the stories will feature the werewolves of the Otherworld, Elena and Clay, Jeremy, Karl and other members of the American Pack. These are some of Kelley Armstrong’s best-loved and most enduring characters, from bestselling books such as Bitten, Stolen and Frostbitten.